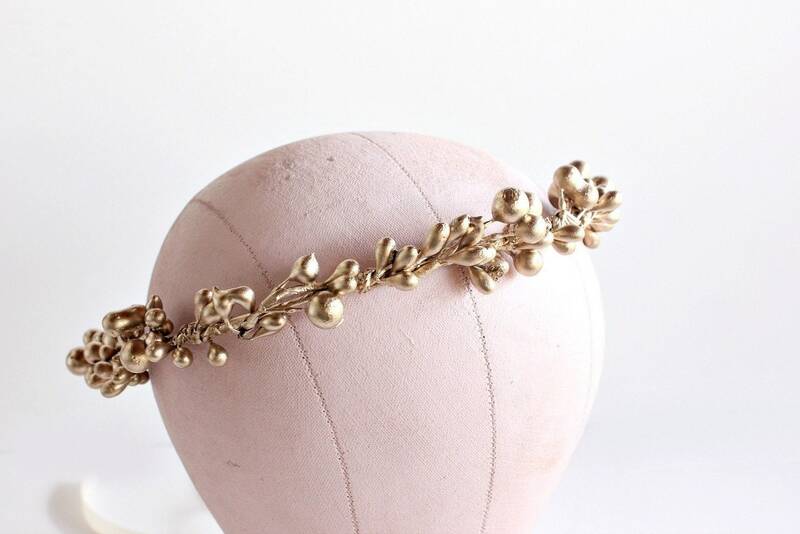 Lovely rustic chic inspired crown made with berries hand painted with metallic champagne gold paint attached to a vine wire band. Perfect for a woodland or boho inspired autumn wedding or just to add a touch of pretty. Can be used as a headband or tiara. 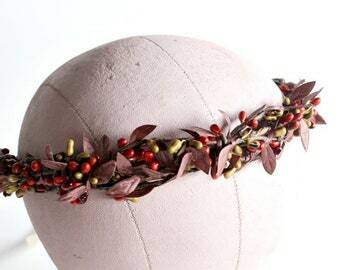 This berry crown is open on the back and have anivory ribbon to adjust to fit any size of head. 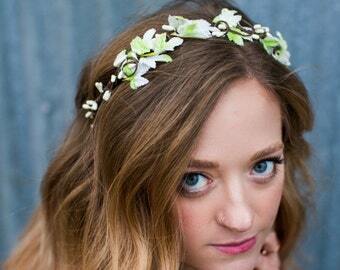 OMGosh- this flower crown is SO beautiful! And it arrived so fast and was wrapped with obvious love and sweet detail. I am so pleased with this shop and would highly recommend it!! 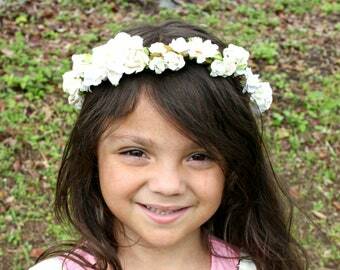 This crown is absolutely perfect for my flower girl! Very customizable and easy to work with. Very happy the the results and the quality! She even included a precious necklace that my flower girl with love. Thank you! I accept VISA, Master Card, American Express, and Discover. I also accept payment by PayPal This does not require that you have a PayPal account; you can check out with a credit card using PayPal. Payment must be made in full and have cleared before the item is shipped. Roses and Lemons items are handcrafted carefully with high-quality materials and inspected before shipping. However, if you are not happy with your purchase, please do not hesitate to contact me and I'd be glad to work something out. ♥ Because all items are for your Special Days all sales are FINAL. Please choose your item carefully as most of my pieces are made to order and I do not create pieces as "samples" or "try before you buy". ♥ Under certain conditions I will accept returns. Contact me within 3 days of receiving your item. Please send it back in its original packaging and in new condition. I DO NOT refund any shipping for returns. I do accept custom orders on a limited basis. Please message me for availability and pricing PRIOR to placing an order. An exact quote will be provided to you after we go over the design's details. This fee is a reflection of the time and effort spent on creating your custom order. I DO NOT accept returns on special orders which includes custom/reserved orders or orders of large multiples for special occasions such as birthdays, or bridesmaids jewelry. This is due to the time involved in creating each piece by hand so be sure to order carefully. Your order is handcrafted for you with the highest attention and I love for you to be happy with your purchase. If there is any problem please do not hesitate to contact me. Most of my designs are custom made upon order, please expect 4 to 5 days for shipment. All packages are shipped via USPS first class mail with delivery confirmation in the USA and Puerto Rico. Upgraded shipping is always available upon request. Your items will be shipped to the address you list on ETSY. All international orders are shipped via USPS International first class mail (tracking in some countries). I am not responsible for any duty taxes or lost packages. I am not responsible for any duty taxes. You are responsible for any taxes or customs fees that may be incurred when accepting your package. I am legally required to report a package's full value and an accurate description, therefore I WILL NOT mark it as a gift, or decrease the declared value of your purchase. Thank you. Some of my designs include vintage findings that are aged and will have small imperfections. If you are not satisfied with the product please let me know and I will gladly work with you to correct any situation.